There is an old adage—“Don't judge someone until you've walked a mile in their shoes.” I plead guilty to not fully internalizing this principle. Two weeks ago, the Jewish "nation-state" law was passed. In this column, I made it clear I thought it was a bad, unnecessary law that would hurt Israel’s standing in the world. But to be frank, I thought it was just another ill-advised law the right-wing had passed, which could have some bad legal implications in the future. I assumed the major harm would be done to Israel’s image abroad—an image Prime Minister Benjamin Netanyahu, to whom the passage of the law was important, appears to no longer care about. I was wrong. What I, and many in the Israeli public, did not take into account was the reaction of Israel’s non-Jewish minorities to this bill. The most outspoken against the law have been the Druze. They are a separate ethnic-religious group within the Arab world, who live in Israel, Syria, and Lebanon, and have a long history of being loyal to the state in which they live. They have served in the army and the other security services with distinction, since the establishment of the state. They have been forthright in their opposition to the nation-state bill, calling it “a punch in their gut”—i.e. those who have been loyal to the state are being paid back with a law that discriminates against them. Supporters of the law claim there is nothing in the law that discriminates against non-Jews. Opponents maintain it is not what’s in the law, but what is omitted. Head of the Opposition, former Foreign Minister Tzipi Livni said she had begged Prime Minister Netanyahu to add the line that exists in the Israeli Declaration of Independence, which guarantees equality to all residents—Netanyahu refused. The Druze have called for a large demonstration this Saturday night in Tel Aviv’s Rabin Square to protest the nation-state law and demand changes. They also established a protest tent in the square, in advance of the demonstration. To better understand the Druze position, I sat down with one of the organizers of the upcoming rally, Jaber, youth division chairman of the fight against the law. “First, equality of rights for those who fight for it, and rights for everyone who defines himself as an Israeli, and for all those who work for the country.” Jaber was a little uncomfortable when I asked him about other citizens who do not necessarily “work” to further their Israeli identity (e.g., Arab Israelis whose identity is more complicated and who, by-and-large, do not serve in the army.) He said that it's not his job to define who receives rights. Jaber is very careful not to criticize the government. He says the rally is not political and that no political figures will speak at the rally. Jaber hopes the committee appointed by Netanyahu will suggest a change in the law. As we talk, two individuals join us in the protest tent—one, a wounded veteran who had fought alongside Druze in the army and the second, Dr. Uri Leibowitz, a professor of philosophy,like his father, the renowned Yeshayahu Leibowitz (who after the Six Day War warned of that war’s disastrous consequences.) Both were less optimistic than Jaber, stating they doubted Netanyahu would agree to any changes, as the bill serves him politically, and for him, that’s all that counts. Indeed Netanyahu made an offer later in the day not to change the law, but to create a special status for the Druze and others who serve in the army. 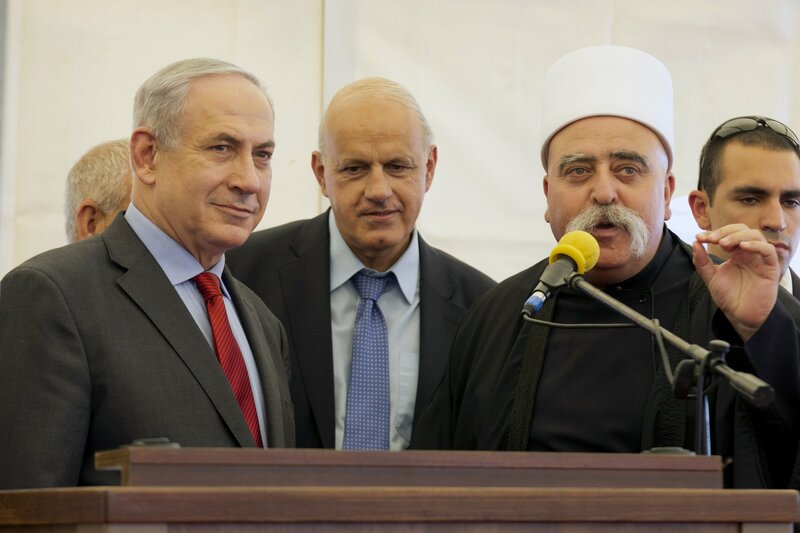 After an internal debate, the Druze community rejected the offer and remains committed to their demand to change the original law. Away from the square, I spoke to Oded, who is 77 and has lived in Tel Aviv his whole life. I asked him what he thought of the Druze protest. He said he supported it 100%. He did not understand why we needed the nation-state law or why the government has been passing a whole set of laws that undermine the democratic nature of the state, while continuing to go around contending we are the only democracy in the Middle East. Why Is Trump Cutting Off All Aid To Gaza?